This lovable 19 inch shaggy pup will melt their heart, especially when he arrives in this unique over-sized basket made of wood and sea grass. This romantic gift basket is filled with all the right stuff to make a heart go pitter-patty: adorable 19 inch shaggy puppy box of creamy chocolates heart shaped box filled with chocolate confections decadent Belgian truffles rich Godiva chocolate gourmet popcorn mixed with cashews assorted chocolate dipped luxury cookies butter cookies amaretto almond cookies (delicious.) 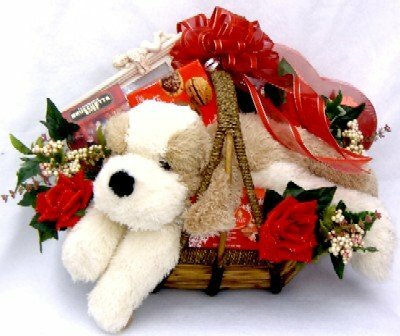 Truffle cookies rum frosted pecans gourmet crackers cheese spread imported caviar our "puppy love" gift basket is trimmed with silk ivy, red roses and elegant satin ribbon, creating an absolutely stunning gift for your special someone.